It goes without saying how important it is to understand your customers - who are they, how did they find about your site, from where did they come to your site, what do they do when they are on the site, how much time do they spent on the site, are they making a purchase. Web Analytics is the tool that helps you to tell a story about your customers’ journey on your site and sketch a picture about them. It helps you to understand how you can give them a valuable experience. The data is all there and analytics can answer almost any question you may have about your customers. Analytics shows you the journey your users take on their path to purchase. We will set up your Google Analytics account, and install the tracking code on all the pages of your website. There are 4 types of Analytics reports you can have. Audience - who are they? Acquisition - how did they come to your website? These reports will give you a better understanding of your customer behavior and you can customize your digital marketing activities to achieve better results. Even offline you need to understand your customers. Current marketing scenario is ‘Do more with less’ – less people, less budget. In this scenario, it is not easy to acquire new customers. It is easier to track existing customers. Ignoring existing customers can lead to higher customer churn, and loss in revenue and profit. So, it is important for every business to take regular feedback from their existing customers, especially on these 4 questions. #1 Do you know what your customers say about your products/services? #2 Do you know what factors are considered important to your customers? #3 Do you know what is your Net Promoter Score? – Likelihood of recommending you, the most important growth indicator. #4 Do you know whether customers will consider you for future purchase? 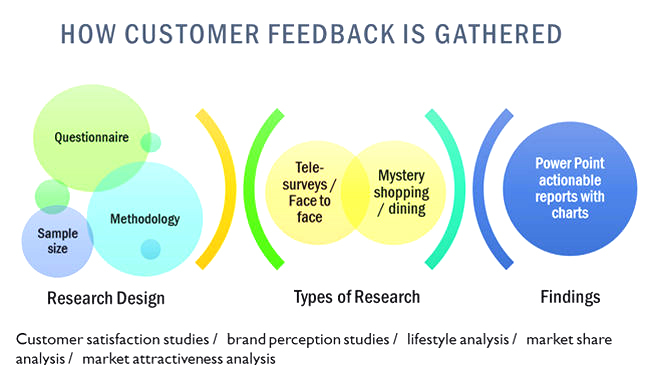 Why is it important to take customer feedback? So, do you know whether your existing customers are happy with you? One of the effortless ways to grow your business is from your existing customer base. So, do you know your Net Promoter Score, the most important growth indicator score? It is the willingness to recommend your business to others. The existence of any business is its customers. All decisions are meant to be taken with the best interests of customers in mind. So, before you take important decisions minimize your risk by taking your customer’s feedback. With our team you can manage customer research for any budget affordable to you. Based on your research brief we design the questionnaire, manage the data collection, data analysis and present to you Power Point actionable reports with charts and graphs. We also help you to use the feedback your customers give to customize your marketing activities and make it more targeted and effective. Request a quote to find out how research and analytics could be used to better understand your customers .